– It's a sight no one thought possible again: a complete NASA space shuttle – the winged orbiter, twin rocket boosters and a massive external tank, all authentic hardware – standing vertical as if the vehicle was about to blast off for space. 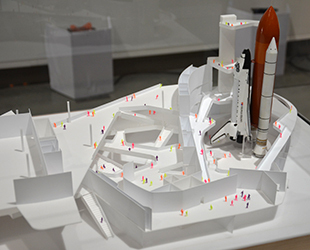 "The ability to preserve an entire stack of flight hardware will make the [center's new] Samuel Oschin Air and Space Center an even more compelling educational experience," said Jeffrey Rudolph, president and CEO of the California Science Center, in an interview with collectSPACE. "It will allow future generations to experience and understand the science and engineering of the space shuttle." 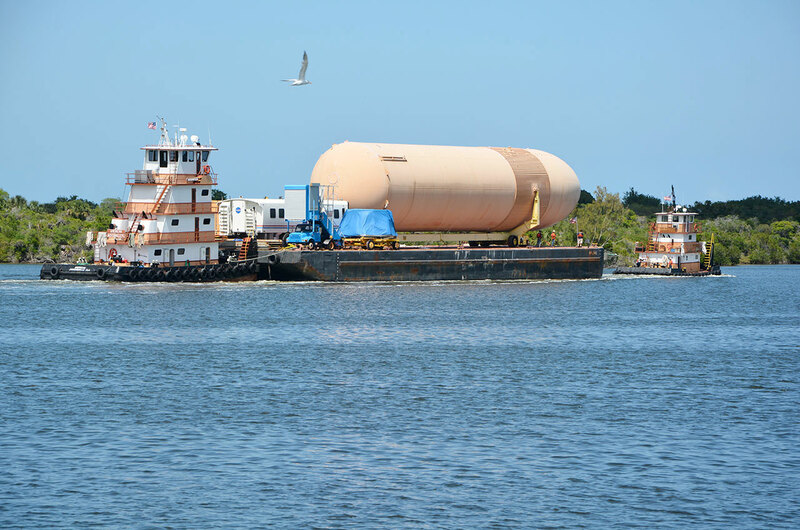 The orange-brown tank, which will be transported by barge from New Orleans to California via the Panama Canal and then moved overland through the streets of Los Angeles, will be stacked with NASA's retired orbiter Endeavour and a pair of boosters that were obtained earlier. The California Science Center had planned to construct a replica of the tank until NASA agreed to donate the historic hardware for the unprecedented exhibit. NASA awarded Endeavour to the science center in April 2011, a month before it lifted off on its 25th and final flight. After being made safe for display and flown to L.A. atop a modified 747 jetliner, the iconic spacecraft embarked on a three day, 12-mile (19-km) road trip to the center's Oschin pavilion, where it has been on exhibit since October 2012. The external tank served as the structural backbone of the space shuttle and fed liquid oxygen and liquid hydrogen to the three main engines mounted to the aft of the orbiter. 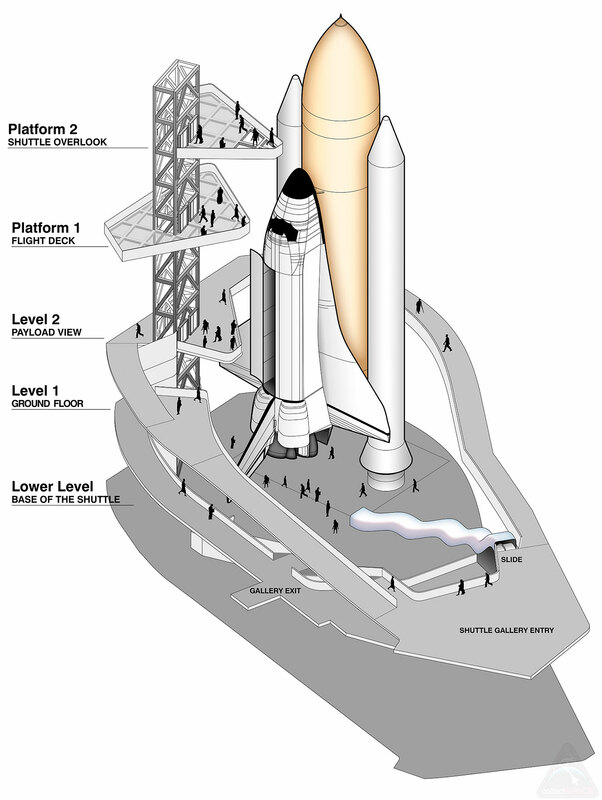 The tank was the shuttle's only major component that was not recovered and reused after launch. When Endeavour reached orbit on its final flight on May 16, 2011, its spent tank was jettisoned to be destroyed when it fell back into the Earth's atmosphere, just like every other external tank that launched before and after it. 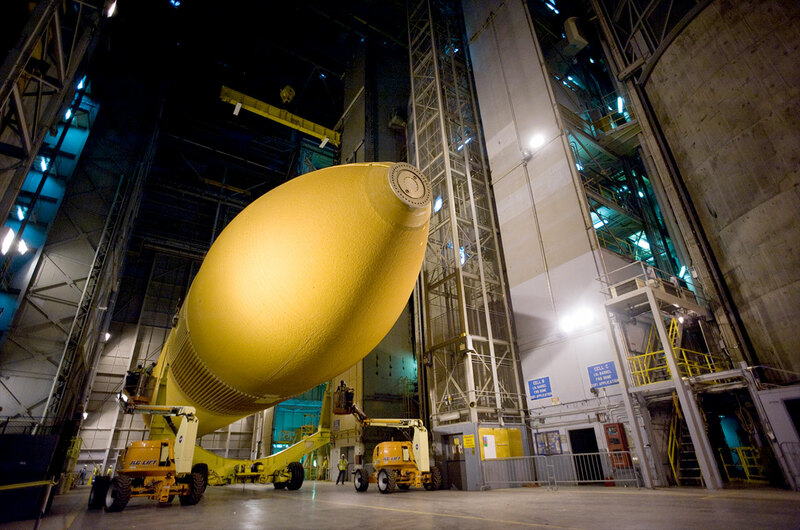 Over the course of the 135-mission, 30-year program, 136 flight-qualified external tanks were constructed at NASA's Michoud Assembly Facility in Louisiana. Just one of those tanks, no. 94 (ET-94), was never launched and so it exists today. ET-94, a so-called "lightweight tank," was built at a time when NASA was transitioning to using even lighter "super lightweight tanks" to be able to launch the heavier parts needed to assemble the International Space Station. ET-94 would have likely flown on a science-dedicated mission were it not for the loss of orbiter Columbia in 2003. 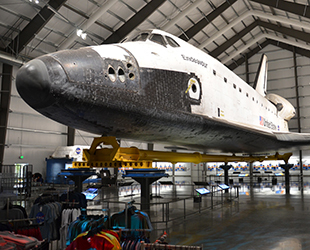 "Since all of the missions after the accident were to the International Space Station – with the exception of the one high-altitude mission to service the Hubble [Telescope] – there was never an opportunity to use the tank," explained Dennis Jenkins, project director for Endeavour's display at the California Science Center. Instead, ET-94 became a test article, used to validate the modifications made to the external tanks that enabled the shuttle fleet to safely return to flight after Columbia. 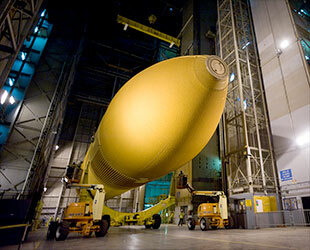 It was also considered for use with NASA's new heavy-lift rocket, the Space Launch System (SLS), slated to fly in 2018. "There was some initial interest within NASA to use ET-94 as a prototype SLS core stage but for various reasons this never happened," Jenkins stated. "NASA also examined various parts of ET-94 as part of its understanding how to build the SLS core stage." As it was no longer needed, ET-94 transitioned to serving as a display at Michoud. It even had a brief cameo in the 2013 movie "G.I. Joe: Retaliation," doubling as a missile. Today, it sits in its wheeled carrier just outside the facility where it was assembled. But wheels will not help its move to the California Science Center — at least not at first. 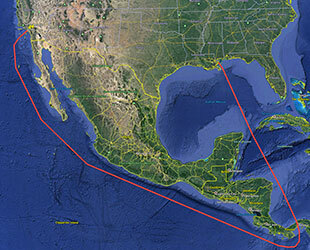 "Since the tank is much too large to move overland, we will barge it from Michoud, through the Panama Canal, to Los Angeles," Jenkins told collectSPACE. "The majority of that route – minus the stop in L.A. – is the same route taken by the four tanks that were sent to Vandenberg [Air Force Base] before that launch site was closed." 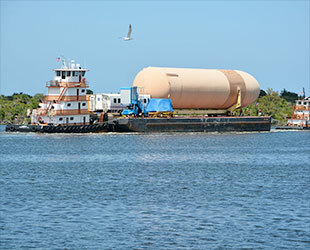 A commercial barge will be used to transport ET-94 on its one-way trip to California. Once at port on the U.S. west coast, the external tank will embark on a road trip through the streets of Los Angeles, similar to the three-day journey that Endeavour took to the science center three years ago. "The tank is not nearly as wide (32 feet versus 78 feet) or as high (35 feet versus 56 feet), but it is a bit longer (154 feet versus 122 feet). It is also lighter," Jenkins described. "Therefore, we will impact fewer utilities and this time we won't need to remove any trees on the move to Exposition Park, although we may need to trim a few to make sure they do not brush the tank as we pass." 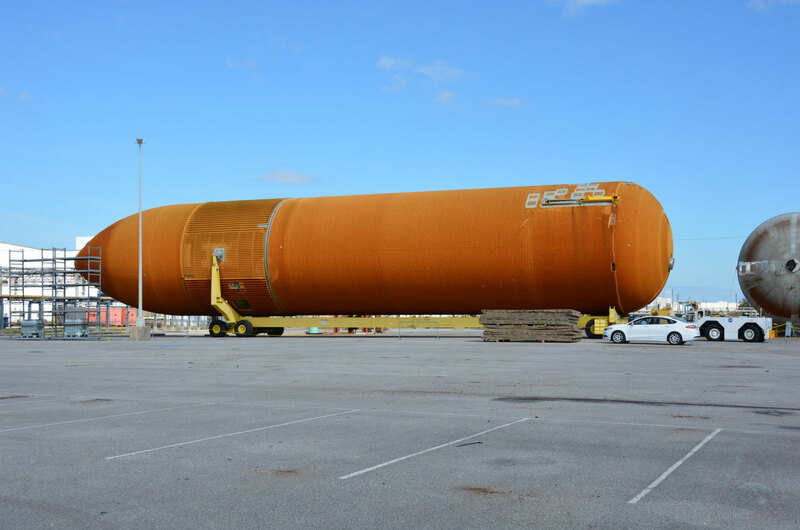 ET-94's entire trip, from Michoud to the science center, is expected to take six to eight weeks to complete. 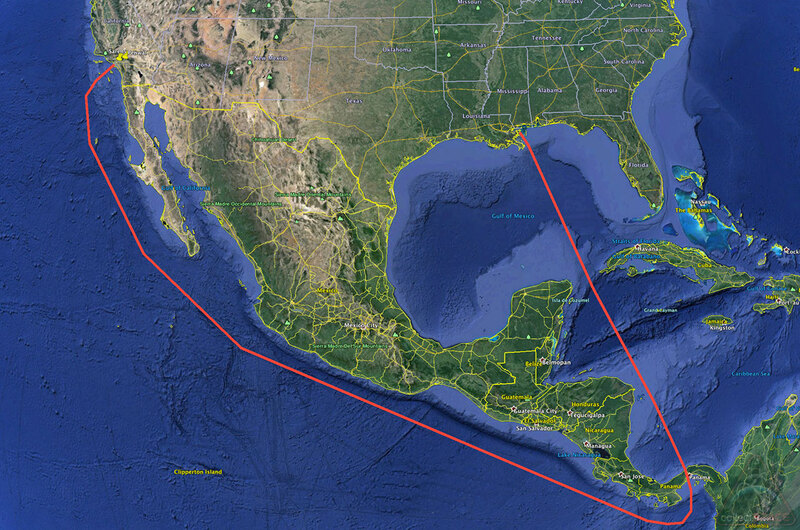 Current plans call for the tank to leave Louisiana later this year or early in 2016. "The timing is driven by the progress of some work on the ET that will take place before its journey to Los Angeles," Jenkins said. "There's some cosmetic restoration needed to fix foam where it was [earlier] removed for various tests and evaluations." 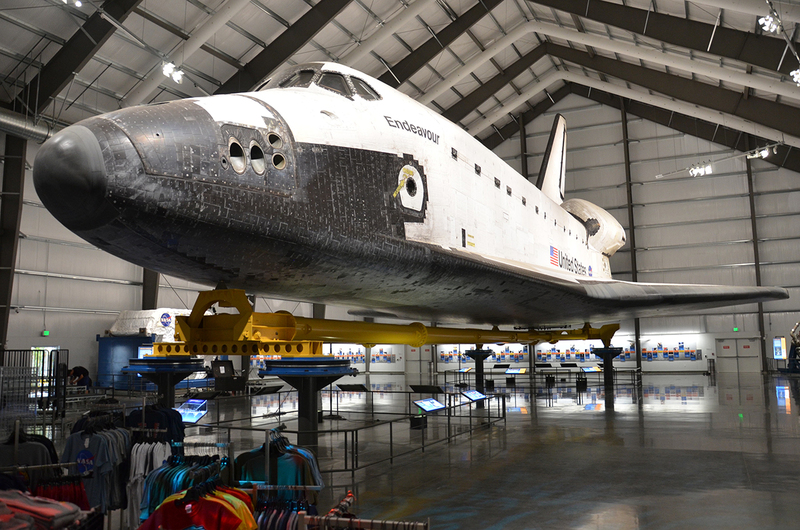 At the California Science Center, ET-94 will be reunited with its shuttle mounts and other hardware to get it ready for mating with Endeavour. "About 18 months ago, NASA gave us all of the orbiter-ET attachment hardware from ET-94 to use on our [planned] replica tank," Jenkins said. "So we will need to install that hardware, along with the pressurization lines and feedlines that NASA removed several years ago." And then ET-94 will wait. 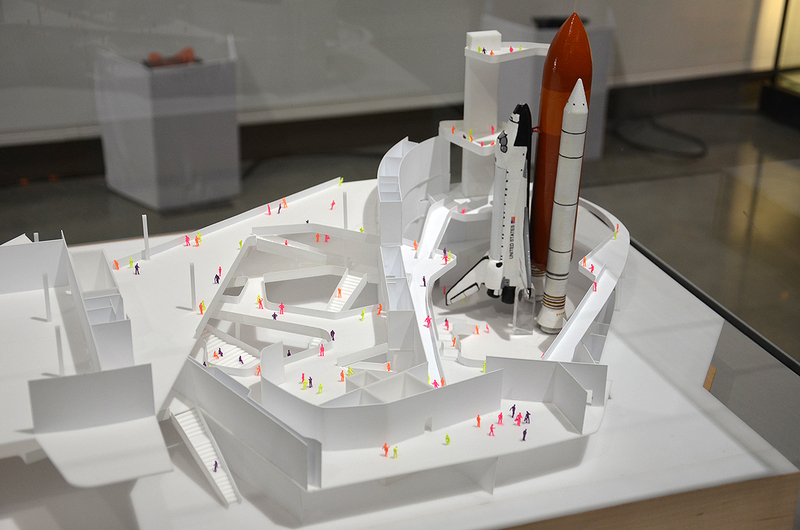 The science center plans to debut the fully-stacked space shuttle in 2018 inside its still-to-be-built Samuel Oschin Air and Space Center, named for the late philanthropist whose family foundation made a "transformational gift" toward the exhibit. "Our fundraising efforts are progressing well," Rudolph told collectSPACE recently. "We're nearly half way to our $250 million goal for the EndeavourLA Campaign." Groundbreaking for the Air and Space Center is expected to take place around the same time that the external tank arrives in Los Angeles. Unlike NASA, the California Science Center does not have a towering Vehicle Assembly Building to stack the orbiter, boosters and tank in the vertical. Instead, the components will be mated while they are on the ground. The stack will then be carefully raised up using one of the world's largest cranes. To prepare for that operation, which the center has dubbed "Go for Stack," Jenkins and his team opened Endeavour's payload bay doors in October 2014 to install a Spacehab module that the orbiter carried to space. When it debuts on exhibit in the Air and Space Center, one of Endeavour's two bay doors will be open, offering visitors the chance to see the cargo inside. The twin solid rocket boosters, previously displayed at the Kennedy Space Center in Florida, were delivered by truck to California in 2012. Currently held at NASA's Armstrong Flight Research Center, they will be moved to the science center closer to when stacking operations are set to begin. First though, ET-94 needs to arrive. "We've dreamed of displaying a full stack of real hardware since the development of our master plan in 1992," stated Rudolph. The tank's journey to the science center, and its subsequent reunion with the orbiter, will be historic." "With the same outpouring of community support we saw with the arrival of Endeavour," he said, "we look forward to celebrating this gift from NASA." 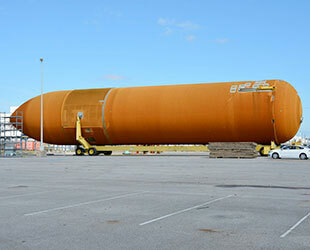 See here for more photos of the last external tank, ET-94.